One of the things we like best about selling vintage items is finding the right homes for the gems we find. We consider ourselves more like adoption assistants for objects than dealers just trying to make a living, and as such we often find ourselves smiling when we don’t make a sale but make connections with people over objects. A recent example of this occurred at Facebook. Since my Bride is a whiz with threads, yarns, and needles of all shapes and sizes, we have a great many of her creations personalizing our Cottage. 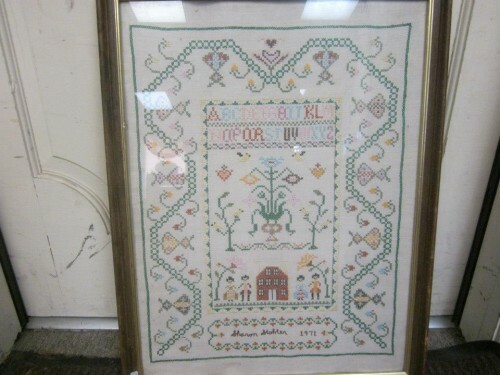 It was that early ’70s era when stamped cross-stitch kits, patterns for knit & crochet wearables, and quilts started the revival of handiwork which exploded in 1976–the 200th anniversary of our nation’s independence. Apparently, Sharon or her family do not appreciate her handiwork; I hope you find loving home for this charming creation.